Will You Come Join Us? Since 1997, the John Carroll Society has offered scholarships to freshmen, sophomores, and juniors attending the Catholic high schools of the Archdiocese of Washington, D.C. The Society bases the awards on essays submitted by students and written on topics identified by the Society to encourage students to reflect more deeply on their faith. The Society awards a scholarship of $2000 in memory of Margaret Mary Missar for the author of the first-place essay; a scholarship of $1000 for the author of the second-place essay; scholarships of $500 each for the authors of two to three third-place essays; and scholarships of $100 each for authors of up to ten essays that receive honorable mention. The Society invites the first-place winner and his or her family to receive the award at the Society's annual dinner and submits the essay for publication in the Catholic Standard. The 2019 competition, with the theme, "The Future of the Church Will Be Shaped By Its Saints," has begun, with the announcement letter, essay question, and contest instructions all available here for review. The winning essay in the 2018 competition was submitted by Olivia Young, a senior at the Academy of the Holy Cross. Click here for a complete list of winners for the 2018 competition. The winning essay in the 2017 competition was submitted by Olivia Young, a junior at the Academy of the Holy Cross. The Annual Dinner serves as the primary source of funding for the Agnes E. and Joseph P. Vaghi/John Carroll Society Scholarship, inaugurated by the Society in 2004. This scholarship provides a $4,000 annual award for each of six students at Archbishop Carroll High School. 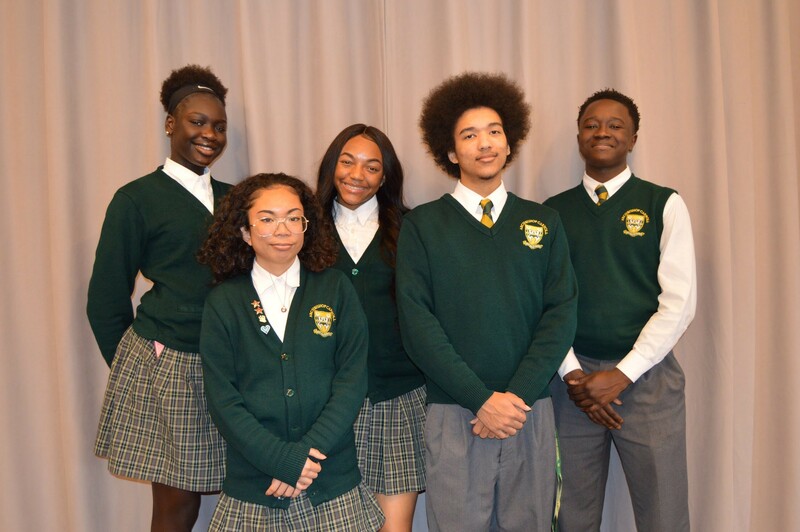 The Vaghi Scholarship winners at Archbishop Carroll High School are (from left to right): Maria Gakdeng (Class of 2021), Paula Marie Valenzuela (Class of 2020), Tiffani Rae Pittman (Class of 2021), Avery Middleton (Class of 2020), and Abubakarr Tonkarra (Class of 2022). The Society bases the awards on essays submitted by students and written on topics identified by the Society to encourage students to reflect more deeply on their faith.